So why am I eating so lavishly? First, it's because my aunt from HK is here. This would be her second time in Vancouver. Second, it's because grandma won the lottery of $2000 and intends on using all of it to eat at nice restaurants with the family of (5ppl). I am certain that it will be easily spent since grams likes to eat western food. Thusly (is that even a word?) I will name the following post "Binging with grandma" from now on. 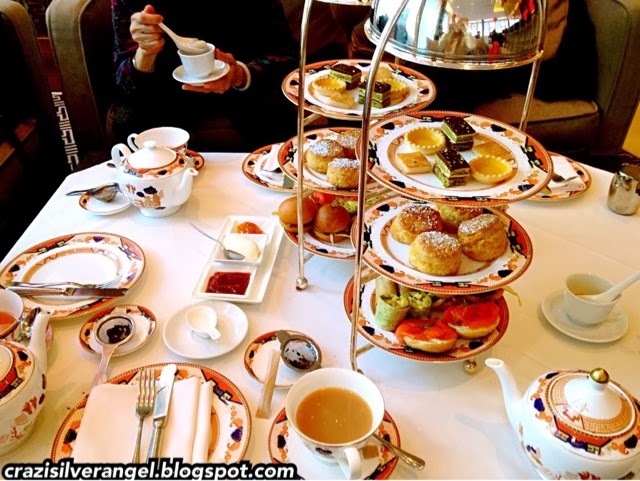 Today, we 4 ladies went to Shangri La for tea. I am sure grams has never been to afternoon tea before. After some urgent etiquette run down, like how to use the weird tea strainer that hangs, we were all relaxed and lounging on the couch. It was even more special when the live music started playing ^_^! The only problem was that the volume was high and some notes were played so strongly that it blared out of the speaker. As well, there was a rude Asian (that gives other Asian people a bad name), who decided to watching youtube videos on his phone during the performance. I'm glad the waitress noticed and adjusted the volume accordingly. Finally, the Asians started to feel the mounting pressure they've caused and decided to stop. From then on, I had a enjoyable time. I am pleased with their new Asian fusion tier. I especially like the savouries. The food did not come in a timely manner (approx. 45 mins) and when I prompted them, they told me it will come when it's ready because it needs to be made fresh. Wow! So.. What's my reservation for ? There's got to be more items on the tier that is already made to be plated. If anything, I'm coming at 2:30pm, then maybe take down my credit card so you can start making my food 15 mins before I arrive so that it'll take you 20mins to bring me food from when I sit down?? I think the waitress had a translation error because she was very apologetic afterwards. Shangri la is having a special this February. People born in the year of the horse is eligible for free tea!